AUCKLAND, New Zealand, April 12, 2011 (ENS) – New Zealand police and the military officers are keeping a close eye on Greenpeace activists swimming in the water to block a deep sea drilling operation of Brazilian state oil company Petrobras off the East Cape of New Zealand’s North Island. 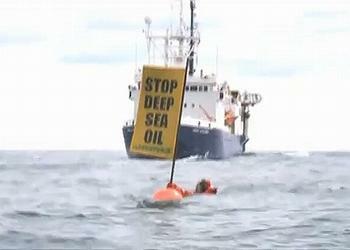 Swimmers bearing flags with the message ‘Stop Deep Sea Oil’ are entering the water in front of the oil survey ship Orient Explorer and diverting the ship off its course in the Raukumara Basin. The ship suspended its seismic survey Sunday after several Greenpeace protestors in survival suits swam close to the Petrobas vessel, making it unsafe to continue the survey. Vessel operators said they fear not being able to stop in time to keep from hitting people who swim across their bow. Today, a New Zealand Air Force plane is flying over to monitor the protest and to ensure that the survey ship can continue with the seismic testing it has been conducting between 12 and 200 nautical miles off the Cape for the past week. Police officers in Navy inflatable boats today threatened the protesters with jail and fines if they get too close to the survey ship or seismic testing support vessel Ocean Pioneer. Skippers of the four Greenpeace protest vessels were handed notices directing them to stay at least 250 meters from the bow and stern and 200 meters from the port and starboard sides of the survey ship and support vessel. Protesters violating the orders could be fined $10,000 or imprisoned for up to a year. The Singapore based Orient Explorer is conducting the first seismic study of the area since Petrobras was awarded an $118 million five-year permit last June. The oil company is hoping to find liquefied natural gas in the 12,000 square kilometer area. The New Zealand government has granted Petrobras the right to drill one well. On March 27, a support flotilla of 20 yachts and smaller boats escorted a group of four yachts out of Auckland harbor on their way to join the local Maori tribe te Whanau-a-Apanui in their campaign to defend the coast from deep sea oil exploration. The two groups joined forces to begin the direct action on Sunday, April 3. 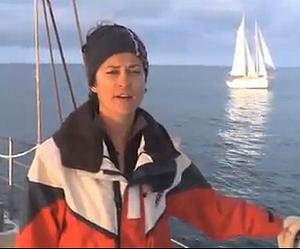 Referring to the massive BP oil spill from an exploratory deepwater well in the Gulf of Mexico last spring and summer, she says New Zealanders object to the possibility of such a oil spill in their waters. The Greenpeacers also say this seismic survey is being conducted at the height of the whale migration season, and the whales’ migration path takes them directly around the East Cape. The East Cape iwi Te Whanau a Apanui says Petrobras has no right to be in the waters that lie east of their tribal lands and objects that the tribe was not consulted before the exploratory permit was issued. Prime Minister John Key has said he is concerned that protesters are stopping legal exploration work. Acting Minister of Energy and Resources Hekia Parata Sunday expressed her disappointment at the action of Greenpeace protestors who disrupted the Petrobras research program. Industry lobbyists have warned the New Zealand government that if protesters are not kept from interfering with oil and gas exploration, New Zealand will been seen as an unattractive location for petroleum development, jeopardizing millions of dollars of potential profits.